The Printer Installer Workstation Report is designed to show the current workstations that have the Printer Installer Client installed. This report enables customers to run a health status check on Printer Installer Clients because it displays the version(s) of the Printer Installer Client installed, Workstation Short Name, Workstation Long Name, Workstation Operating System, Workstation IP, User, Initial Check-In Time, and most recent check-in time of the Client. To access the workstation report, sign into the Printer Installer Administrator Console and go to Tools > Reports > Workstations. Clicking Search with default settings will display all workstations. 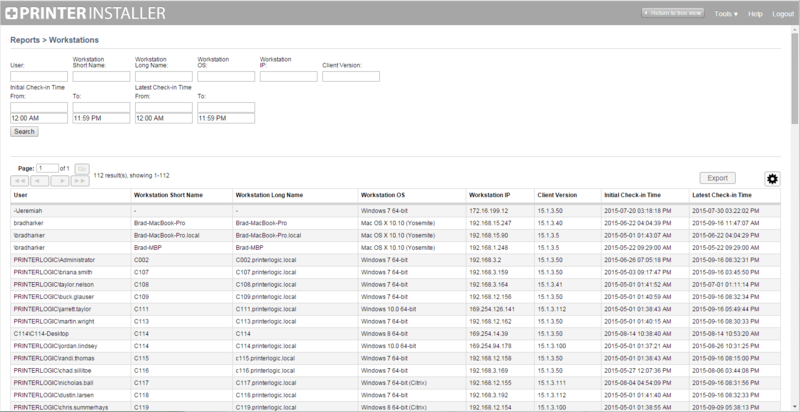 Filtering can be done based on any data type, such as workstation name or latest check-in time.